Product prices and availability are accurate as of 2019-04-16 02:55:07 BST and are subject to change. Any price and availability information displayed on http://www.amazon.co.uk/ at the time of purchase will apply to the purchase of this product. 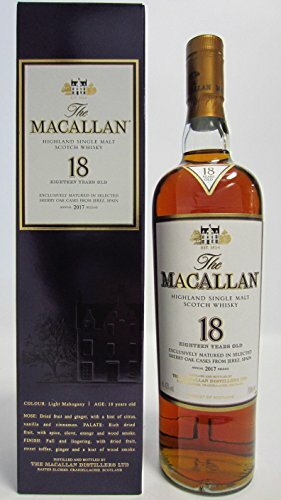 The 2017 release of the Iconic Macallan 18 year old aged in Ex-Sherry casks from American and European oak. Nose: Dundee cake, ginger latte, brandysnaps, sweet dried fruit, toffee apple, clove studded blood orange, leather, honey glazed ham, glace cherry, sweet and aromatic spices and some wood smoke/cigar box like nuances. Palate: A well balanced delivery of sweet dried fruit (raisin/date/sultana and fig) dry and meaty notes(treacle baked ham) woody notes (nutty oloroso sherry/charred vanilla resin) and spice (ginger/nutmeg/clove & cinnamon) add in some more layers of flavour in waxy orange, smoked glace cherry, sticky toffee, caramelised apple and some savoury leathery and you have one hell of a complex and rich body and mouthfeel. Finish: Big and chewy with wave after wave of sweet dried fruit, savoury cured honey baked meat, aromatic tobacco, spicy & nutty sherry wood and an almost Cognac like grapey finish, i also got some dark chocolate and orange bitters towards an impressive end. Hard to get away from all the hype and pricing going on with Macallan but at the end of the day this is still a benchmark Sherry cask aged single malt, hard to fault and so easy to enjoy, regardless of the price!